Greg Grant has worked for years to hybridize, select, and introduce some truly great perennials for gardens, landscapes, and containers. This includes Turkscaps, Lantanas, Gardenias, and more! These plants are all sure to do great in the south central and southeastern US. This Greg Grant introduction produces loads of white spikes of tubular flowers from late spring to fall on this durable, Texas tough native. Augusta Duelberg Mealycup Sage is larger growing than the ones found at most nurseries and will top out at about 30"H and wide. This is a wonderful drought tolerant, reliable, native perennial for the garden. Item# 9782. 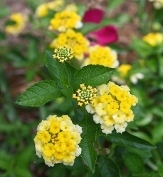 Similar to New Gold in habit and flower power, Buttercream Lantana produces clusters of golden yellow flowers that change to a soft golden yellow and finally to white. An excellent Greg Grant introduction with somewhat more of a pastel effect than that of New Gold. Great for butterflies and pollinators! Buttercream Lantana is a low growing mounding Lantana suitable for use as a groundcover, at the front of the garden, or spilling from containers. Item# 9904. The interesting and beautiful, yellow foliage of this Greg Grant selection of the Giant Coneflower makes for a wonderful contrast with other garden plants. Just as vigorous, easy, and tolerant as any other Great Coneflower, Golda Emanis Rudbeckia produces large golden yellow daisies on statuesque, 5-7' stalks in mid to late spring. Great in foliage or flower. Item# 10111. This Greg Grant introduction produces loads of medium-dark blue spikes of tubular flowers from late spring to fall on this durable, Texas tough native. Henry Duelberg Mealycup Sage is larger growing than the ones found at most nurseries and will top out at about 30"H and wide. This is a wonderful drought tolerant, reliable, native perennial for the garden. Item# 9781. 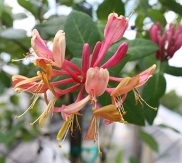 Pam Puryear's Pink Honeysuckle produces large clusters of 2" deep pink tubular flowers with white throats and are lightly fragrant. 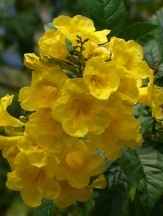 The fragrance is most noticeable in the late afternoon and evening. This is an excellent addition to the garden with its mannerly habit, disease resistance, and the profusion of spring and early summer flowers. We apologize for any confusion but this is actually an old, likely hybrid, honeysuckle that originated from Pam Puryear's grandmother's garden in Navasota, Texas. "It has also been sent around as 'Welch' and as 'Navasota'. "-Greg Grant. Item# 9340. 1", sleepy, rose to coral-pink flowers are borne from late spring to fall on this vigorous perennial. Tough, easy, and great for Hummingbirds. A relatively new introduction from that great Texas plantsman Greg Grant and was named after his friend and the 'Rose Rustler' founder Pam Puryear. This Turk's Cap has won the prestigious Lynn Lowery Award from the Native Plant Society of Texas! Item# 1082. It's hard to beat Turk's Cap for sheer flower power! From summer to fall the brilliant red flowers just keep coming. Red Hot, a.k.a. Red Spreader, is a lower growing and more spreading form of Turk's Cap with slightly larger red flowers that was selected by plantsman Greg Grant who also developed Pam Puryear's Pink, and Big Momma. Greg says that Red Hot has a more noticeable lower and spreading habit when grown in full sun. Excellent for Hummingbirds and Butterflies, especially the Sulphurs. Item# 9726. 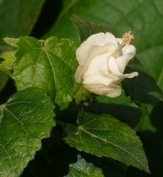 White Lightening Turk's Cap is a new Greg Grant introduction with a more vigorous growth habit and produces loads of pure white blossoms that are held against the dark green foliage. Mix this one in with your red flowered Turk's Caps for a wonderful contrast where it will flower from late May to November. Item# 9738.